Sarwat Chadda's Blog: Tour continues. And they brought pie! 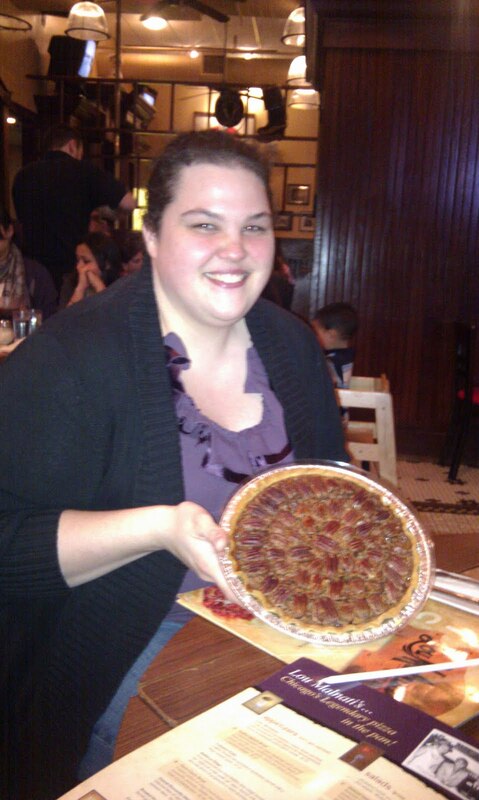 This is Stacey from PageTurnersBlog and we met yesterday at Anderson's bookstore in Naperville and she brought a (home-made) pecan pie, for me! And jolly nice it was too. In fact, so nice I had it for breakfast. This actually brings me to today's discussion. The bloggers. Not only did I meet Stacey, but Ari from Reading in Colour and Heidi and Jasmine (yabibliophile and the reading house wives blogs respectively). I am in awe of their commitment and enthusiasm for the world of books and YA. Ari is frighteningly young and incredibly wise, well beyond her years, it's very very cool to have such people supporting your books. She totally should be president. Rachel Hawkins and I went out for supper with a few of them afterwards and I sat there somewhat embarrassed by how much more knowledgeable they were about my industry than I was. And this is done out of love and passion, they don't get paid and frankly bookbuying is not a cheap hobby, especially nowadays. I pick up a lot of my readung list by checking out what they're recommending, and they know their stuff. With the printed press only reviewing the big, established names, their's is really becoming the only way of finding out what's new. They review everyone, famous and not so famous. So, to all the bloggers out there, I salute you. Keep up the incredible good works you do, we couldn't manage without you! Yesterday's event was a lot of fun! Can't wait to dive into Hex Hall (and Slice of Cherry) and of course, I'm anxiously awaiting more news on Billi # 3, Ash and Hollywood! Oh and I've well aware of the PageTurners blog, I wish I had more properly introudced myself, I'm a fan. Oh gosh am I really frightening? I try my humble best ;) Seriously though, thank you so much for your kindness and listening to a teenager ramble on and for writing such wonderful books. Enjoy the rest of your tour! I'd like to point out I didn't eat ALL of it! It was shared and there were but a few small slices left when I took it back to the hotel. I mean 'frightening' as a compliment! That pie looks delicious - I'm late aren't I? And it's all gone! LOL yes, there were 5 of us at dinner so we shared and then Sarwat had the last 2 pieces for his breakfast hehe.